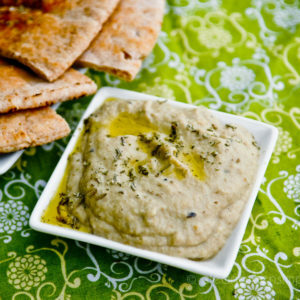 Smoky, creamy homemade baba ganoush – a fabulous Middle Eastern dip recipe for your collection! 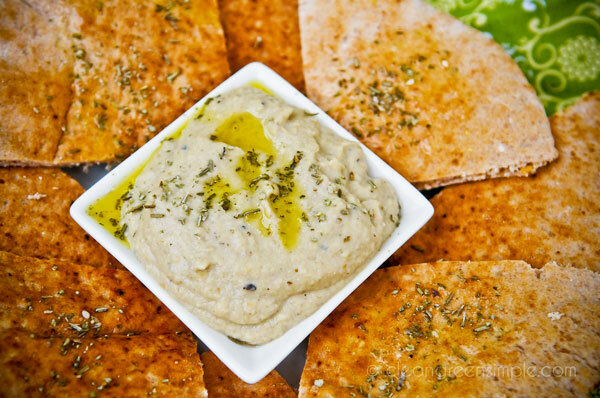 There’s a Mediterranean restaurant near my parents’ house that serves an awesome plate of four different dips (and a big bowl of pita bread) – I believe it includes a regular hummus, a spicy hummus, a white bean and rosemary dip, and baba ganoush. They are all good, but I always kind of want to ask if I could just replace the other three dips with more baba ganoush – I love it so much! Baba ganoush (or baba ghanoush, baba ganush, baba ghannouj or baba ghannoug. Wikipedia offers them all as options) has a wonderfully complex flavor that makes it seem like a much more elaborate dish than it really is. If you’ve never had it, I highly recommend it! Turns out it’s not terribly complicated to make as long as you know the secret trick to getting that fabulous smoky flavor. 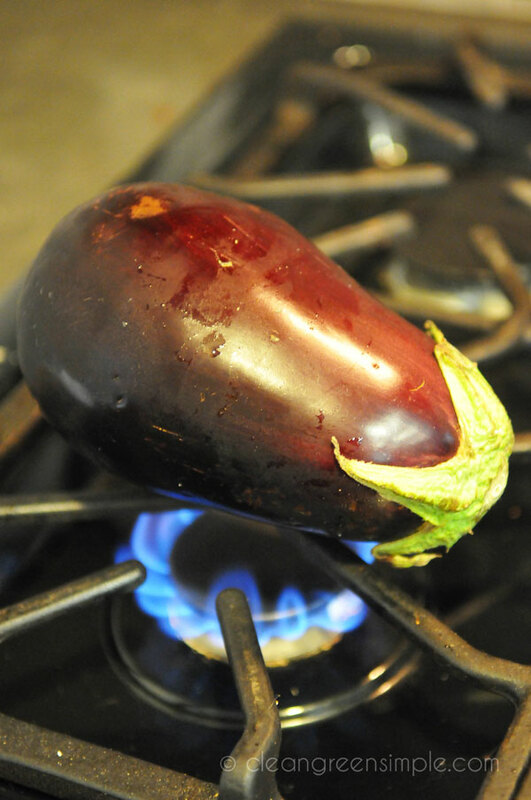 Take an eggplant, and without removing the peel or anything, pop it directly onto a burner on the stove. I don’t know if this would work with an electric stove, but I bet it would work with a grill. Using tongs (or at least an oven mitt) roast it over medium-high heat until the outside starts to get all black and bubbly – this should take maybe five minutes or so, not too long. Then pop it in a pot and let it heat, covered, for about 30 minutes, turning once halfway through. Once it’s all nice and soft, take it out of the pot and put it in a bowl. Cut it in half (you’ll want to cut it while it’s in the bowl so you can keep the juices that come out) and scoop out the flesh and seeds from the inside, removing the burnt skin. Try to get most of the skin out, but a few little pieces are fine, that’s what gives it a great smoky flavor. Once you’ve got the flesh scooped out, stick it in a blender or food processor along with a bit of tahini, lemon juice, sesame seeds, salt, and a small clove of garlic and blend until smooth. Add a tablespoon or so of olive oil and quickly blend just to combine it. 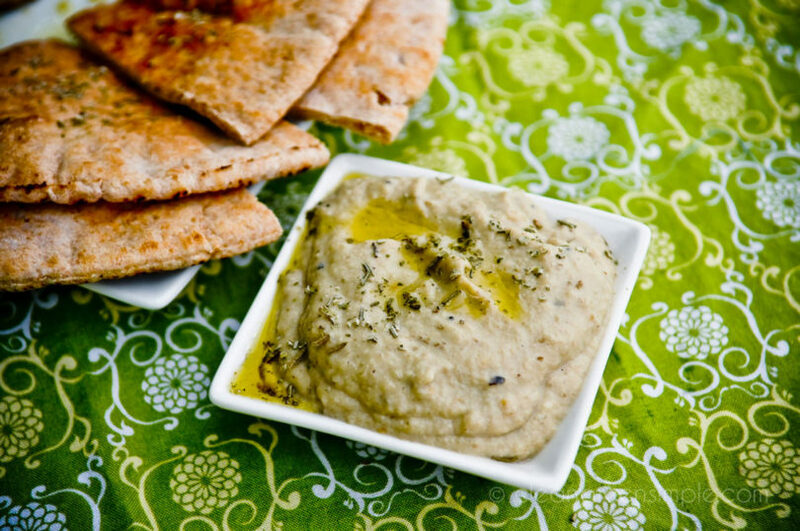 Serve it with some nice warm pita bread, or even just on vegetables or crackers, and you’ve got restaurant-quality homemade smoky baba ganoush! Don’t skip the roasting step, it really won’t taste as good without that smoky burnt skin adding depth and flavor. Other than that, you can mix it up to your heart’s content – more lemon, more tahini, more garlic, skip the sesame seeds…just have fun! 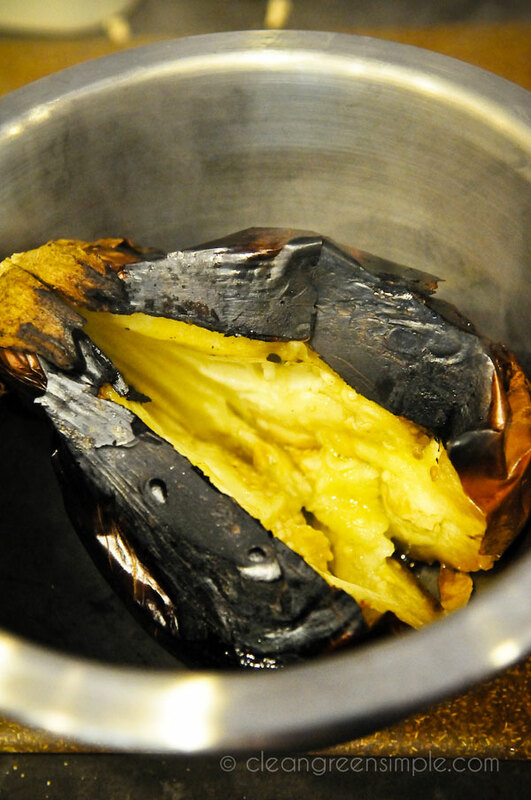 Place the eggplant directly on a gas stove burner and heat over medium-high, turning occasionally, until the outer skin is black and bubbling – about five minutes. 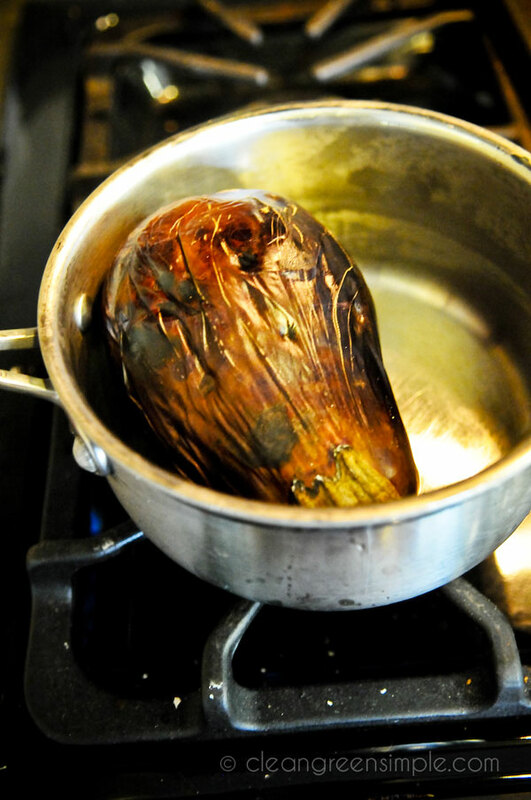 Place eggplant in a pot and heat, covered (it’s important that it be covered) over medium heat for about 30 minutes, turning once halfway through. Remove eggplant from pot and place in a medium bowl. Cut in half and scoop out flesh and seeds, discarding burnt skin (it’s okay if a little bit stays in, just remove most of it). Add eggplant flesh, tahini, lemon juice, sesame seeds, and garlic to the bowl of a food processor or blender. Blend until smooth – about 30-60 seconds. Add one tablespoon olive oil and blend until just combined. Scoop out onto a serving dish and drizzle with another teaspoon or so of olive oil. 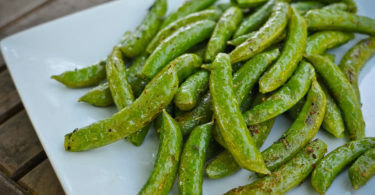 Serve sprinkled with za’atar spice blend or oregano and salt. Can be served immediately or refrigerated for a couple of hours before serving. Delicious. 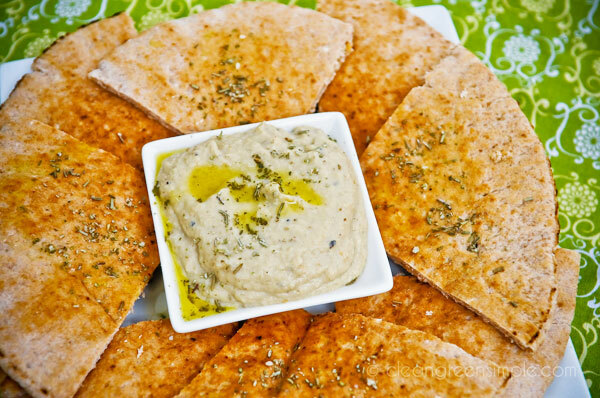 My perfect pitta and dips platter would have baba ghanoush and muhammara (roasted red pepper dip); they both have that delectable smoky flavour. Thanks for the inspiration! I am seriously in love with your blog! Cheers! 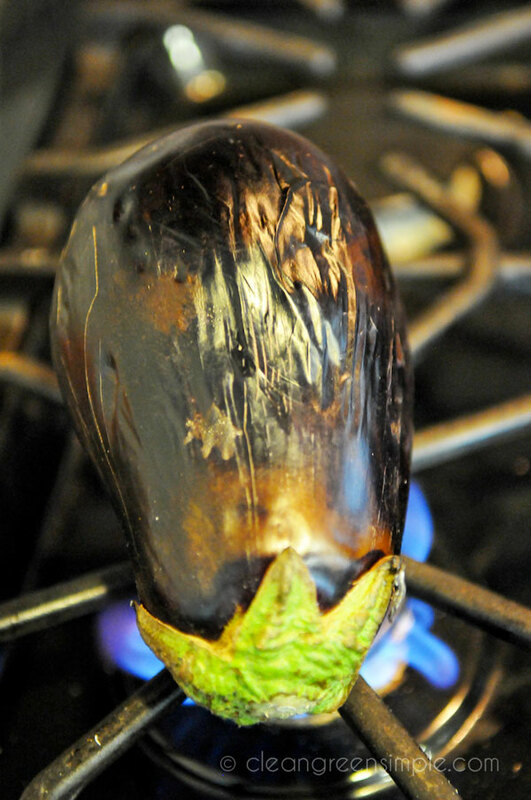 You can roast eggplant in the oven (for those without a grill or gas stove). Cut the eggplant in half, brush with oil, and bake face down. Oh, good point – you could also blacken the skin under the broiler to get that extra smoky flavor! Made this tonight, delicious!!! Thank you. 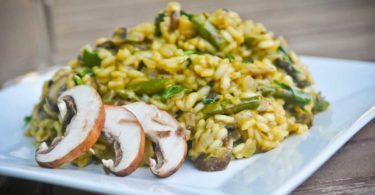 What a great simple recipe! I have found the baba ghanoush in restaurants often has dairy. Yeah, I’ve noticed that too! The restaurant I mentioned verified that they don’t, but it’s annoying how often it is in there. Can’t wait to make this! I’m wondering, when you put the eggplant in the pot, do you add water? Nope, it just goes straight in – some people wrap it in foil instead but I use a pot so I don’t have to waste foil. Looking forward to this, as I am in the middle of making it right now. We have a pepper roaster grate that we bought in Mexico, and that’s what I used to roast the eggplant right on the stove. The grate just goes right over your gas burner. Easy. I never succeed at getting that smoky flavor you find in the restaurant versions. I blackened it as recommended but I still find it inferior. Any other suggestions? Did you make sure to leave some of the skin in the final mix? The more of the blackened skin you leave in the smokier it will be. Looks great! So happy I found your site!! Love to make healthier choices for my family! I think they will like this one! Thanks for sharing! I was wondering how to get that smokey flavor without a grill and was resorting to liquid smoke. Thanks so much for the tip!